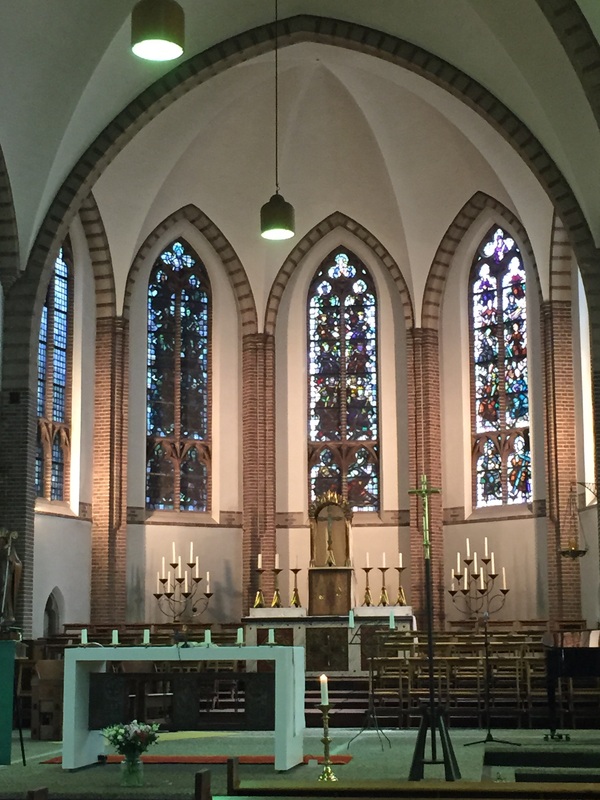 Last weekend I was on my annual visit to friends in the Netherlands, and so on Sunday I made a return visit to St. Ansfridus, the Roman Catholic church I had visited last year. On my first visit I was surprised and thrilled to meet a ‘pastoral worker’ who had taken the service. What had surprised me was the sight of a woman, vested, leading a Roman Catholic Mass. Of course, the bread and wine had already been consecrated, but still, it was lovely to see a woman playing such an active role in ministry. And I have to admit, it wasn’t what I expected. I was happy to have another opportunity to worship there. 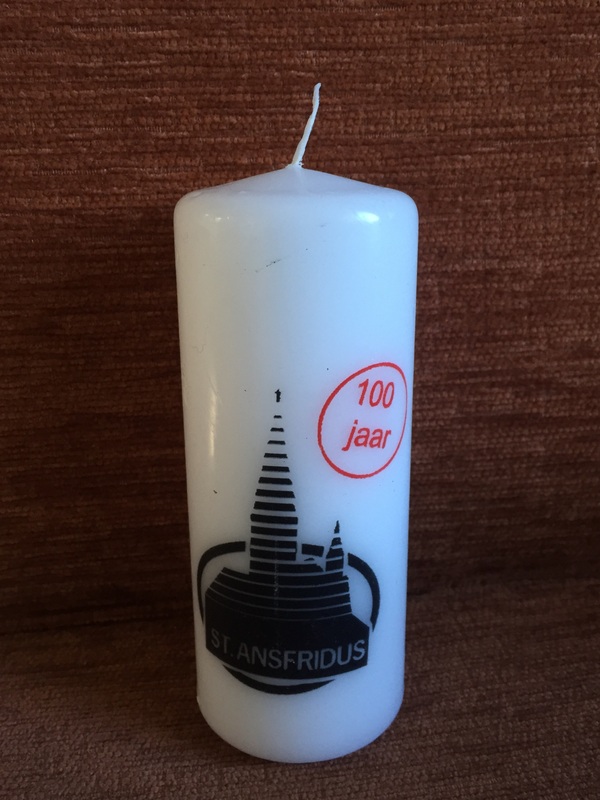 So here he is, St. Ansfridus of Amersfoort, or to put an Anglicised slant on it, St. Ansfried. Last year I neglected to write much about the saint himself, so I shall start by remedying that. 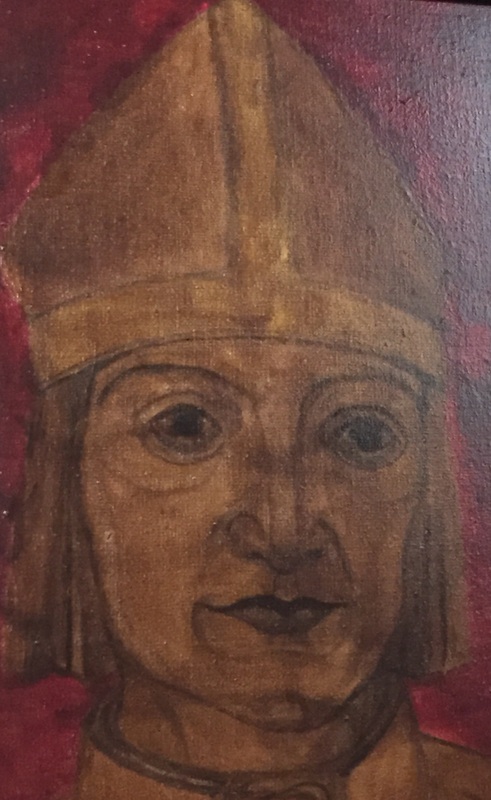 Ansfridus was Bishop of Utrecht at the end of the tenth century, but before that he was a knight, in the personal service of Otto I. He was married to a woman called Heresuint and had a daughter called Benedicta. He founded an abbey, which, like Whitby Abbey founded by St. Hilda, housed both men and women. His daughetr was abbess there, and Ansfried planned for his whole family to retire there. That was not to be. His wife died, and Ansfried asked to be allowed to become a monk and spend the rest of his days leading a monastic life, but instead he was prevailed upon to become Bishop of Utrecht. At this point he wasn’t even a priest! He agreed and was ordained priest and consecrated Bishop at the same ceremony. He held this office for about a decade, and during this time founded another abbey. Finally, when his health was failing he was allowed to retire to the abbey and there he spent his final days, in service to the sick. He was buried in the Cathedral of St. Martin in Utrecht. His feast day is May 11th, and he is the patron saint of Amersfoort. This church is the only one which bears his name. Back to the church in the twenty-first century. When I visited last year, I was told that the church might be closing; there were simply too many churches in the parish. I was glad to visit this year and hear that the church has been given a reprieve, at least until 2020, and is proudly celebrating its centenery this year. We arrived at the church about ten minutes before the service was to begin at 11am. Time to pick up the booklets we needed and light a candle. There are two booklets needed for the service; one that contains the liturgy and all the music and readings for the week, and is produced centrally, maybe by the diocese or the Roman Catholic church in the Netherlands, and the other, smaller leaflet containing the page numbers and references and several extra settings for parts of the service. This second leaflet is really important, because it helps you find your way through the larger booklet. The service was led by the assistant priest of the parish, who is something of an Internet sensation, Father Roderick Vonhogen. He has his own YouTube channel and posts short animations featuring Lego and explaining events in the church year. There were two other people serving at the altar, a man who was the acolyte, and Marilyn, who was the lector. She later explained to me that the lector each week is responsible for reading the lessons, leading the intercessions and administering the chalice. There was also another woman who led the singing, and a pianist. Last Sunday, the Gospel reading was the feeding of the five thousand. Fr Roderick began his sermon by commenting that Jesus clearly wasn’t Dutch; if he had been then he would have first found out how many people needed food, and then produced exctly enough for them all. There would have been no leftovers, no second helpings. Instead, Jesus produced enough food for everyone and lots more besides. Fr Roderick meditated on generosity, and also pointed out that dividing the numbers present by the number of disciples meant that each disciple was probably responsible for carrying food to roughly the same number of people as today’s parish priest. When it was time to receive communion, Fr Roderick and Marilyn stood at the front of the church and the people lined up in two lines to receive the bread. Only Fr Roderick, the acolyte and Marilyn received the wine. I should have lined up in the right, since I was sitting on that side of the church, but instead I stepped over to the other line, so that I could ask Fr Roderick for a blessing. Being Anglican, I couldn’t receive the bread. The lines moved quickly, and when I was in front of Fr Roderick I told him I wasn’t Catholic, and asked for a blessing. He blessed me in English. Just as last year, I found the experience moving. Instead of feeling cut off from everyone else receiving, I felt truly blessed. The service ended quite quickly, and people either left or went into the church hall for tea and coffee. We spent a few minutes looking round the church, and that’s when I started talking to Marilyn. She was extremely welcoming and full of joy. She invited us to stay for tea, so we ended up in the church hall. She sat down and talked to us, and as a lot of people left Fr Roderick joined us too. We talked some more about his sermon and how a church can take care of the needs of its members. I remembered the first time I had gone to the Lutheran church in Tokyo. When I met the pastor at the end of the service he asked me, is there anything we can help you with? Christ took care of people’s physical and daily needs, and we should, too. Then it was time to leave. I bought a candle commemorating the church’s centenary and shall use it for Morning and Evening Prayer at home when I get back to Tokyo. Once again, I received a warm welcome and felt blessed to have worshipped there. 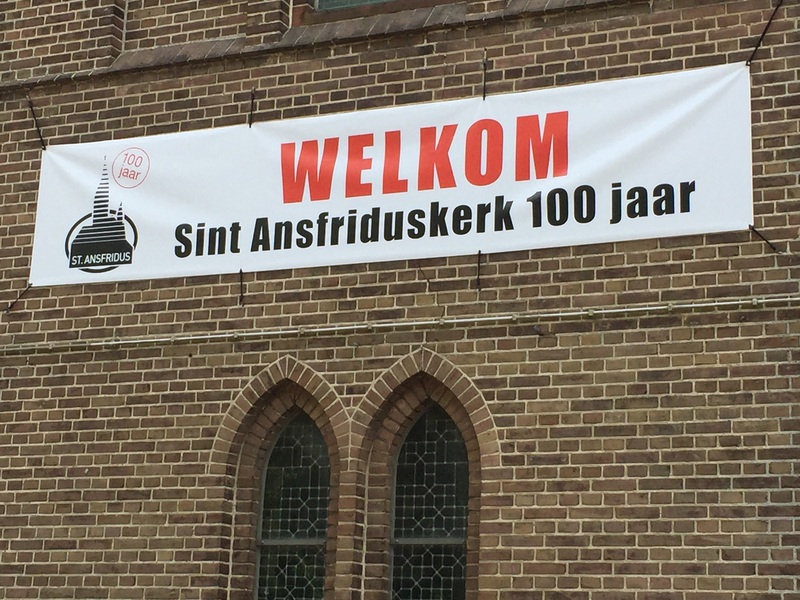 As someone who is not Roman Catholic and doesn’t speak Dutch, I found that welcome and inclusion inspiring and very lovely, and I’m looking forward to visiting again next year. Thank you, St. Ansfridus. 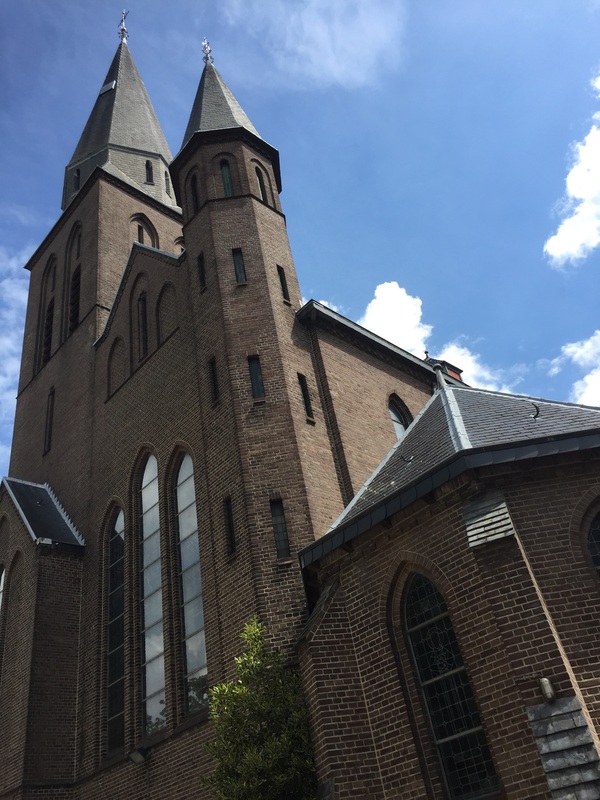 This entry was posted in Travel and tagged Amersfoort, centenary, Fr Roderick Vonhogen, Hilda, Mass, May 11th, Roman Catholic, St. Ansfridus, the feeding of the five thousand, The Netherlands, YouTube by tokyopurplegirl. Bookmark the permalink.